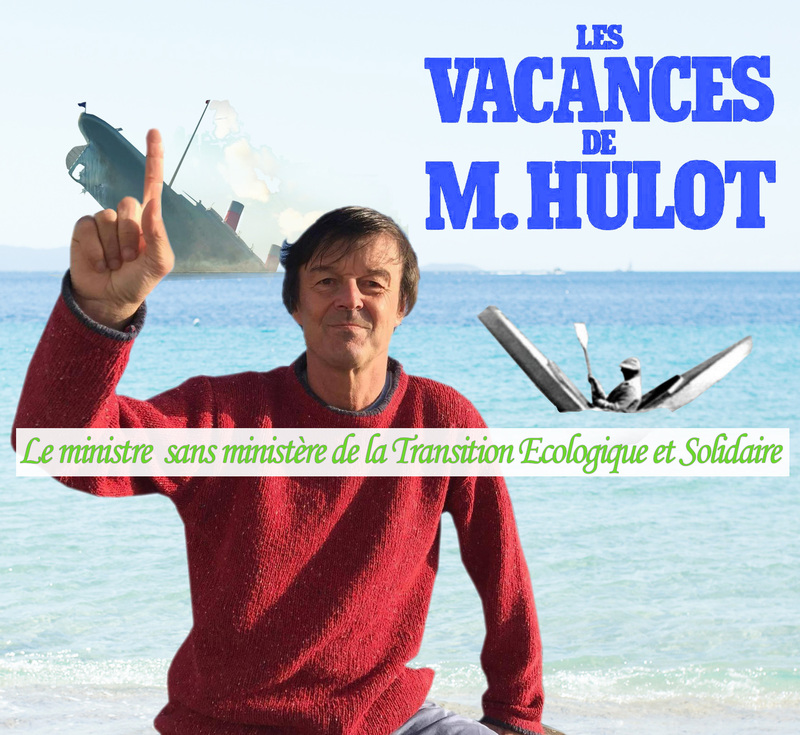 Le ministre sans ministère de la Transition Ecologique et Solidaire Monsieur Hulot can go on holidays without any problem as he did not even had a real equipped ministry with the necessary powers to overrule the ministry of economy, of agriculture, of housing, name it, powers needed to make any progress with the task given to him by Macron to ‘transition from a wasteful economy into a more ecological society based on solidarity’… his role was nothing more than that of a minister without a ministry, captain on an ocean ship in the form of a canoe. He was given no capacity to curtail the big business conglomerates in society that push us further and further into an environmental and social disaster. by the French president Macron just as a ‘figurehead’ to give a green shine to his cabinet. It is not just in France that a real super power ministry with such an impressive name should be constructed, a ministry that can overpower the other ministries that are all totally in the grip of national and transnational companies and their affiliates. Now his leaving is not much more then the comic act of another monsieur Hulot, creation of the French filmmaker Jacques Tati who by his own clumsiness during his holidays manages to destroy his fragile canoe on a calm sea without any waves …. His own schizophrenic position as a media-entrepeneur and criticaster of environmental unfriendly big business has been criticised on several occasions. EDF the French energy firm that is deeply involved in nuclear energy has been one of the supporters of his “eco-campaigns’, also l’Oreal and the multinational Véolia, a firm with a wide scope of activities among others the exploitation of water resources, making profit on this primary human need. Till now it has hardly hurt his reputation as “our eco-man”. Curious enough I discovered a line in his biography that his grandfather, an architect, lived in the same house as the French filmmaker Jacques Tati and the figure of Monsieur Hulot – a series of popular French holiday movies – has been modelled after the grandfather of the now defunct minister of Ecological Transition and Solidarity. The scene with the canoe that breaks in two is the most emblematic from this movie launched in 1953. A scene I saw and laughed about when I was 9 years old, in the Minerva cinema in the village of Heemstede, the Netherlands. I had already made this picture before I learned this, as I associated the summer holiday dismissal act of Nicolas Hulot – because of his name – with the canoe scene in the Tati movie. In the picture Nicolas Hulot has just put his index finger in his mouth and holds it up in the air to sense from where the wind blows, to plan his next step with whom he will associate to continue his double quest for a better environment and his personal well being. I will write later on an analysis of such cinematic propaganda for the good cause and the double meaning such movies have in political practice.